​Watford face Burnley in the Premier League at Vicarage Road on Saturday as both sides look to continue their impressive form of late. 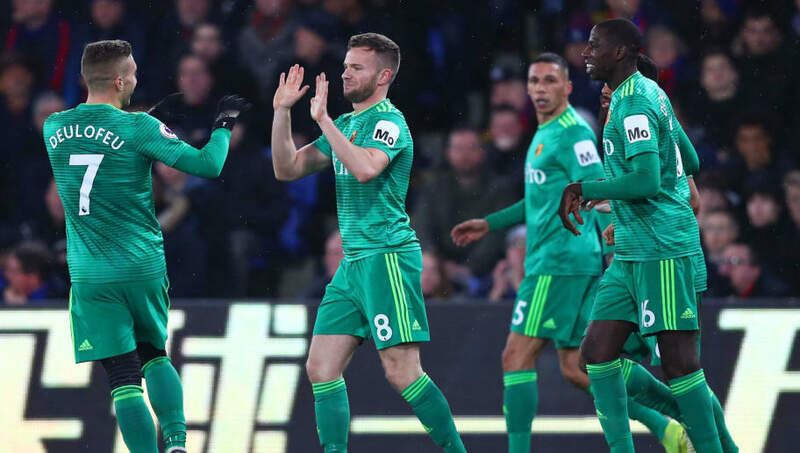 The Hornets are unbeaten in their last four games in all competitions and are currently seventh in the league standings having leapfrogged both Leicester City and Wolverhampton Wanderers last week. Following an impressive 2-1 away victory at Crystal Palace, manager Javi Gracia will he hoping that his side can consolidate that result with a win against the Clarets at the weekend. ​Burnley have been in a rich vein of form in recent weeks, winning their last three Premier League matches whilst also progressing to the fourth round of the FA Cup. The Clarets beat Fulham 2-1 last week despite not having a shot on target as two own-goals by the Cottagers ensure that Sean Dyche's side moved up to fifteenth in the league standings, three points clear of the relegation zone. A victory for ​Watford at the weekend could see them maintain their highly position in the Premier League whilst a win for Burnley would see them edge closer to survival. Check out 90min's preview for the game below. Watford are likely to be without striker Andre Gray and defender Christian Kabasele despite both players returning to training after being sidelined with injuries. Midfielder ​Tom Cleverley is pushing for a start after scoring the winner against Palace last week whilst Domingos Quina is also in contention for a return to the starting eleven. Burnley will head to Vicarage Road without winger Aaron Lennon and midfielder Johan Gudmundsson who are both recovering from injuries whilst goalkeeper Nick Pope will also miss out despite returning for the club's under-23 side in midweek. SD confirms that Johann Berg Gudmundsson remains a doubt for the weekend trip to @WatfordFC. Nick Pope will not be involved as he returns to full fitness. Robbie Brady serves the last of his three-match suspension. The Clarets won't be able to select attacking midfielder ​Robbie Brady at the weekend as he serves the final game of a three-match suspension after being sent off against Huddersfield Town at the start of January. However, despite picking up a knock in last week's victory against Fulham, Phil Bardsley is expected to play some part of Saturday's fixture whilst Matthew Lowton and Steven Defour could also feature. Watford and Burnley have met on five occasions in the Premier League with the Clarets edging the head to head record in England's top flight, winning three games and losing twice. The Hornets however won the reverse fixture between the two sides this season as goals from Gray, Will Hughes and ​Troy Deeney secured a 3-1 victory at Turf Moor in August. The Clarets last victory against Watford came in April 2018 as two goals in three second-half minutes from Jack Cork and Sam Vokes saw Dyche's side take home all three points. The all-time head to head record between the two sides is also in favour of Burnley who have won on nineteen occasions whilst Watford have only beaten their rivals thirteen times in fourty-one match-ups. After a rough period of results which saw the Hornets go six games without a Premier League win, they have lost just one of their last seven in all competitions. Unbeaten in their last four, a win for Gracia's side could see them pull four points clear of eighth-placed ​Leicester City. Burnley have been in a great form in recent weeks, winning four of their last five games including victories over relegation-threatened sides Fulham and ​Huddersfield Town. A fifth-consecutive victory would see the club edge closer to Premier League survival after experiencing an awful start to this year's campaign. With both sides looking to build on the momentum they have gained from their recent unbeaten runs, Saturday's game at Vicarage Road promises to be an absorbing affair. As Watford and Burnley have both been defensively suspect in terms of conceding goals this season, there should be opportunities for the likes of Deeney, Roberto Pereyra, Chris Wood and Ashley Barnes to add to their tallies at the weekend. Three wins on the bounce for the Clarets should give them the confidence to take at least one point back to Lancashire whilst Watford may fall just short of a victory against a side who historically tend to have the upper hand over the Hornets. In what will be an enticing battle, both sides will share the points and cancel each other out.